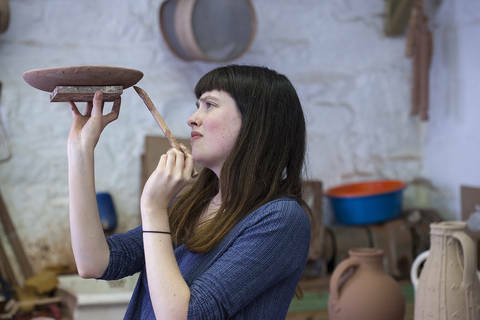 The Modern Makers 2017 programme ran from March - August 2017 and saw four young people work with slipware potters Douglas Fitch and Hannah McAndrew - http://www.fitchandmcandrew.co.uk/. Over the duration the Modern Makers worked with Hannah & Doug in their pottery near Castle Douglas two days a week where they were introduced to various aspects of the slipware process, from the mixing of materials, the making and decorating of the pots, through to assisting in the exciting firing of the pieces in the wood kiln. They also gained an insight into the running of a pottery business and undertook a trip to Potfest. The group also took trips around the region to visit other potters and spent a day each with Clare Dawdry, Christine Hester Smith, Ruth Jones, Peter Wareing, Andy Priestman and Archie McCall learning different techniques and finding out more about each individuals approach to making. "It was really interesting watching Hannah and Doug run the business – planning and preparing for the various shows and orders they’ve had over the last 4 months. Seeing all the stages that are involved in running a business like theirs was really eye opening and something that I’d never had any contact with before." "I have learnt a lot of techniques that I believe will be useful in my own practice. It has also been great to have met Hannah and Doug and the other potters we visited." "Modern Makers has introduced me to pottery and craft in the best possible way....I feel like I have people that I can go to for advice and support about making an artistic career in the future. Pottery is also something that I would be happy to do for a living. By learning from craftsmen and spending time with people that make their living independently it has made me a lot more confident about making my own career from art. Before the programme I hadn’t ever really chatted with anyone about what it’s like to be an artist or craftsmen. Through this opportunity I’ve been able to see how it’s done and what it’s like, in a really friendly and encouraging environment." The project ended on 24 August with a meal to celebrate and showcase the tableware which the group created during their time at the pottery. 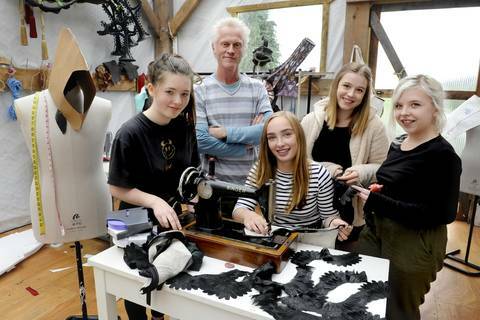 Visit the Modern Makers 2017 blog to find out more about what they got up to. Watch a short film below made by film maker and photographer Colin Tennant which documents some of the 2017 project. Watch more films about Upland on Vimeo. Modern Makers 2017 was supported by Creative Scotland, The Holywood Trust, LEADER and the William Grant Foundation.